The National Intelligence Service on Thursday requested a preliminary arrest warrant for leftist lawmaker Lee Seok-ki on charges of plotting an armed rebellion and breaking the National Security Law. The agency also sought warrants to arrest three other members of his Unified Progressive Party on the same charges. The accomplices have been in custody since Wednesday. On Wednesday, the NIS raided the homes and offices of Lee and other individuals linked to the UPP over allegations that they were involved in plans for a revolt. Lee is suspected of forming a “revolutionary organization” within the East Gyeonggi Coalition, and ordering his collaborators to obtain firearms and to make attack plans against key infrastructure facilities. A total of 14 have been banned from leaving the country. The three persons detained are Hong Soon-seok, deputy chief of the UPP’s Gyeonggi Province branch; Han Dong-geun, chief of the party’s Suwon office; and Lee Sang-ho, an adviser at a progressive group based in Gyeonggi Province. The investigators are also said to have found a large sum of cash at Lee Seok-ki’s home and are now looking into its origins to determine whether the money is linked to the latest allegations. Earlier on Thursday, the investigators resumed their search on Lee’s office which was delayed due to resistance from his aides Wednesday. The UPP said the investigation is intended to divert public attention from its interference in last year’s presidential election. “The NIS, which is the culprit of shaking the nation’s fundamentals, is oppressing the progressive-democratic forces on a scale unseen in history,” Lee said at the party’s emergency conference on Thursday. 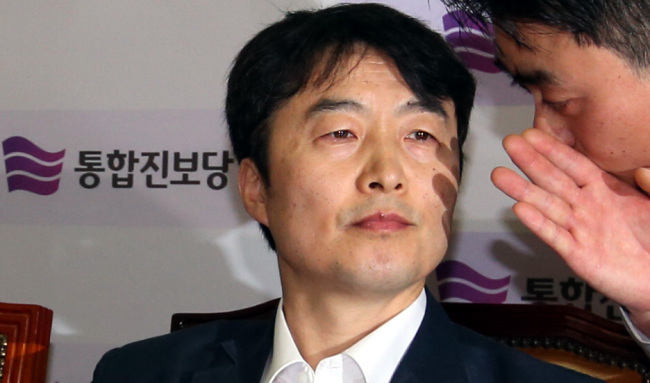 Lee Jung-hee, the outspoken leader of the minor opposition party, also accused the authorities of attempting to frame and dismantle the party. The main opposition Democratic Party, which is conducting a campaign to reform the NIS, is distancing itself from the UPP and observing the situation. The DP has decided to forgo the demonstration calling for reform of the NIS, in which the UPP will be participating. The main opposition also stressed the need for the case to be investigated thoroughly. “If the allegations are true, then this is another case of shaking the nation’s fundamentals. The case requires a thorough investigation,” DP spokesperson Rep. Bae Jae-jeung said. As for questions about the timing of the investigation, the DP spokeswoman only mentioned the issue in passing and that the party will closely monitor the developments. The timing of the investigation has been called into question as the spy agency is facing allegations that it interfered with last year’s presidential election.